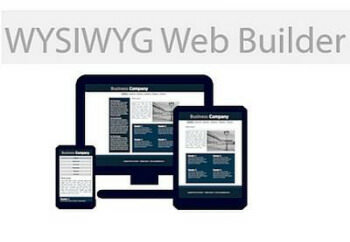 Now available: WYSIWYG Web Builder! • One Click Publishing” No FTP program needed. No special hosting required, use with any Hosting Service! What is new in WYSIWYG Web Builder 14? WYSIWYG Web Builder 14 has more than 200 new features/improvements! Here’s an overview of some of the new features. – New feature: WB14 introduces a new way of creating flexible layouts based on the new CSS Grid Layout. CSS grid layout is a new technique in CSS that allows web developers to create complex responsive web design layouts more easily and consistently across browsers. ‘CSS Grid Layout’ is a two-dimensional grid system that is native to CSS. It does not rely on floats or other hacks. This result in cleaner code and reliable code. To prevent confusion with the existing (Bootstrap-based) ‘Layout Grid’ object, we have named the new object ‘Flex Grid’, because it’s a combination of CSS Grid Layout and Flexbox. The idea behind the Grid Layout is to divide a webpage into columns and rows. The columns and rows have named areas where you can drag & drop objects in. The definition of the layout can be different for each breakpoint. Each grid area supports its own padding, (flexbox) alignment, border and background style. – New feature: Added Google Fonts Manager. Adding Google Fonts to your website has never been easier. Google Fonts no longer have to be manually downloaded/installed from the Google website, The Google Font Manager takes care of this! Fonts that are installed via the Font Manager will be added to the ‘web safe fonts list and the necessary CSS code will be generated automatically when you preview or publish the website. Font can have different variants, like light, medium, bold, regular etc. The available variants can be enabled per font. – New feature: Added Card’ object. A Card is a lightweight, flexible content container. It includes options for headers and footers, a wide variety of content, styling, and powerful display options. The Card object was inspired by Bootstrap’s v4 Card component. – New feature: Cards can also be used as Popovers, this basically uses the Card as an advanced tooltip/pop-up box that appears when the user clicks or hovers on an element. Popovers can be placed at the top, right, bottom of left of the container object and can be activated via click, hover or focus. – New feature: Added support for Structured Data (JSON-LD). Provide a better browsing experience for users on your website and in search engines, and improve your SEO with the built-in JSON-LD generator. – New feature: With Twitter Cards, you can attach rich photos, videos and media experiences to Tweets, helping to drive traffic to your website. If you add Twitter Card meta tags to your webpage, users who Tweet links to your content will have a “Card” added to the Tweet that’s visible to their followers. This is very similar to sharing a link on Facebook which automatically displays a preview with title, summary, and thumbnail of your page content when using Open Graph Meta Tags. – New feature: Implemented a new icon selection window with categories and a search option, so you can quickly find the icon you are looking for. – New feature: Added support for custom Icon Fonts Libraries. Add your own icon libraries or third-party icon sets. Extra Icon Fonts support the same styling options as the built-in Font Awesome. Icon fonts add-ons packages are available for: Drip Icons, Elusive Icons, Feather, Foundation Icons, Glyphicons Halflings, Ionicons, LineAwesome, Material Icons, Open Iconic, Linea Icons. – New feature: Added new master page functionality. In addition to Master Frame you can now also use another page as background template. This does not require a content place holder! Basically, the master page will be used as ‘background’ of the content page and you place all other objects on top of this. If the master page includes a footer then it will automatically be moved based on the content. – New feature: Added support for background transparency (alpha) in Content Place Holder. – New feature: Added preview for animations. – New feature: Added support for ‘filter’ property in transitions and CSS animations. This adds the possibility to animate brightness, contrast, hue, blur, invert, saturate, grayscale and sepia! – New feature: Added several text letterspacing animations. For example: ‘letterspacing focus in’ and ‘letterspacing expand’. – Fixed: Themeable menu does not save italic style. – Fixed: Page Properties- > Advanced displays wrong help topic. – Fixed: Master page does not override background styles in breakpoints. – Fixed: jQuery UI script not included in navigation events. – Fixed: Floating alignment does not work with Bootstrap Accordion. – Fixed: Missing Latitude/Longitude properties in Google Maps script. – Fixed: No slashes before quotation marks in ‘echo’ function (Single Page Protect). – Improved: Many tweaks to optimize floating layout calculations. – Improved: Tab’s min-width calculation with left/right orientation. – Improved: Added support for SVG images in Card. – Improved: Background rendering of Object Manager (with dark color scheme). – Improved: Improved performance of undo/redo when property inspector is visible. – Improved: Page Footer position calculation in text edit mode when used with master page. – Improved: Added hard-coded z-index to modal (jQuery UI) Dialog. – Improved: Background video in Layout Grid/Layer now includes ‘playsinline’. A workaround for iPhone autoplay video limitations. – Improved: Added support for RGB color in Extension datasets. – Improved: Added the ability to use a wildcard (*) in the Object Manager filter/search. This will display all objects regardless of their parent element.